Dell commissioned Demartek to evaluate the performance of the new Dell EMC PowerEdge R7415 servers that use the AMD EPYC 7000-series of processors. Mixed enterprise workloads were run in this VMware vSAN cluster using one model of the AMD EPYC processor in each of three identical nodes. 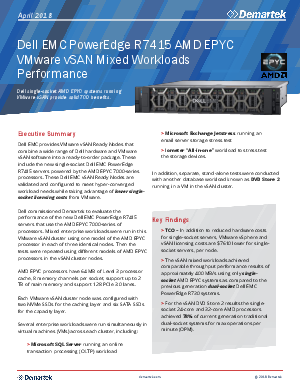 Then the tests were repeated using different models of AMD EPYC processors in the vSAN cluster nodes.